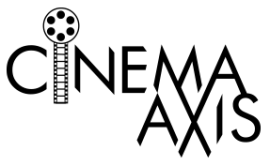 There is nothing more frustrating than a film that has a lot to say, but is never quite sure how to best say it. Elysium is a perfect example of this as it is a film at odds with itself. In his much anticipated follow-up to the Academy Award nominated film District 9, director Neill Blomkamp continues his socially conscious brand of science fiction on a larger scale. This time around Blomkamp tackles issues such as classism, immigration, and most importantly the American health care system. However, unlike his last effort, Elysium cannot sustain itself under the weight of its own watered down ideology. If there has been one downside to the reverberations from the Occupy Movement that dominated the media back in 2011, it is the impact it has had on cinema. Though there will always be those who have and those who want, Elysium seems to exploit this in the most egregious ways. In the world of the film, villains no longer need to have a motive or, in some cases, be criminally insane. In fact, the only thing that you need to be viewed as evil is money and lots of it. It is this lazy sort of logic, coupled with the fact that the last act turns into a comic book film, that makes Elysium such a maddening experience. Set in the year 2154, the world has become an overpopulated and polluted pool of despair. The extremely wealthy have left the planet and now live on a luxurious space station known as Elysium. Filled with mansions, swimming pools, and medical beds that afford both the opportunity to heal all ailments and change a person’s appearance. The poor and the middle class are forced to live on Earth where major cities like Los Angeles resemble shanty towns. Things are even tougher for ex-cons like Max Da Costa (Matt Damon) who must work on the manufacturing line of the Armadyne factory. The company is responsible for building the robots which police the civilians both on Earth and Elysium. Since he was a little boy, all Max has ever wanted was to go to Elysium. When an accident at the factory exposes Max to dangerous levels of radiation, he finds himself with only five days to live. Seeing Elysium as his only hope for survival, Max strikes a deal with Spider (Wagner Moura), a local smuggler, to kidnap neurological information from an Elysium citizen currently working on Earth. The target turns out to be John Carlyle (William Fichtner), the arrogant CEO of Armadyne. Little does Max know that Carlyle recently struck a deal with the Elysium Secretary of Defense, Jessica Dalacourt (Jodie Foster), to stage an elaborate takeover of Elysium. The deal would see the core program that runs Elysium rebooted so that Dalacourt could assume the role of President. Dalacourt feels that President Patel (Faran Tahir), is not willing to take the harsh steps needed to ensure that Elysium remains protected from illegal immigrants trying to access their medical systems. When the hijacking attempt on Carlyle goes horribly wrong, Max finds himself on the run implanted with information that could impact both Earth and Elysium. 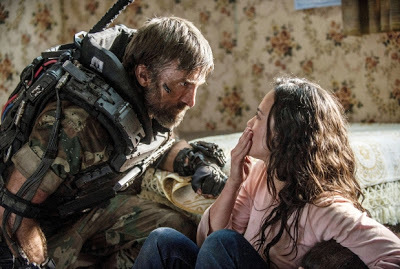 When Dalacourt enlists the help of a vicious mercenary, Kruger (Sharlto Copley), to get back the data trapped in Max’s head; Max finds his life and that of childhood friend Frey (Alice Braga) to be in grave danger. Frey, a nurse who works at the local hospital, has a daughter who is dying from leukemia. As his health rapidly deteriorates, and wearing an exoskeleton that increases his strength, Max must do everything in his power to making his dreams of setting foot on Elysium a reality. The problem with the way in which Elysium presents its class structure is that it never gives a true sense of what the wealthy people on Elysium are really like. Outside of Carlyle and Dalacourt, who are snobbish and arrogant, the rest of the folks on Elysium are portrayed like an advertisement for the Hamptons. They swim in big pools, get medical care when needed, and attend upscale parties. It is tough to buy into the fact that this inherently makes them evil simply because others cannot afford such luxury. Similarly, it is hard to swallow that aside from Frey, the majority of the people on Earth are criminals of Hispanic decent. There is also no real correlation to Dalacourt’s political ambitions and the unfortunate circumstances Max finds himself in. Dalacourt is merely the architect of her own destruction. If she had not been so aggressive in her aspirations, the status quo on Elysium would remain intact. As for Max, it was not Carlyle who caused his radiation exposure but Max’s supervisor, a man who is nothing more than a middle class citizen on Earth. In fact, the majority of shady characters in the film, including Spider and Kruger, are residents of Earth. While the film tries to argue that it was the rich who lead to all the problems on Earth, there is no real evidence of this. Plus Frey is a constant reminder that people can overcome their circumstances and live a respectable life. By portraying the complexities of universal health care in such a slight fashion, Blomkamp actually does the film a huge disservice. This is especially noticeable in the latter half of the film that feels more like a violent version of Iron Man, rather than a thrilling commentary. What made District 9 work so well was its ability to balance both its social commentary and its gripping action sequences. District 9 flipped the conventions of the alien invasion genre on its head by incorporating themes of segregation from the apartheid era of South Africa. Despite being made for three times less than the budget of Elysium, District 9 managed to keep both its story and overall aesthetic coherent the entire way through. 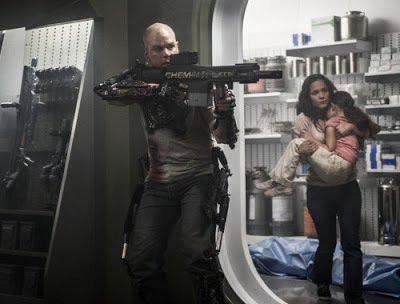 Elysium feels more like a film in which the director has been given more money to experiment with. While the notion of universal health care is an important topic to centre the film around, the second half of the film feels all over the place from an aesthetic standpoint. When not incorporating brief moments of aggressive camera techniques, or using Matrix style slow motion, Blomkamp pauses the action sequences to focus on a quiet shot of blood slowly dripping from Max’s hand. As a result, what starts off as a gripping thriller dissolves in to a disjointed comic book film where things occur mainly because Blomkamp thinks it looks cool. Though it is great to see directors like Neill Blomkamp attempting to push the boundaries of science fiction, he does not quite hit the mark this time around. Elysium had all the makings of a gripping socially conscious action film, but ultimately falls victim to its own overindulgences.